Pilots on both standby and operational duties had no base other than a Portacabin. There was also no lounge area for incoming flight passengers. NSI brought their expertise in commercial interiors North West to provide comfortable facilities for both crew and passengers. 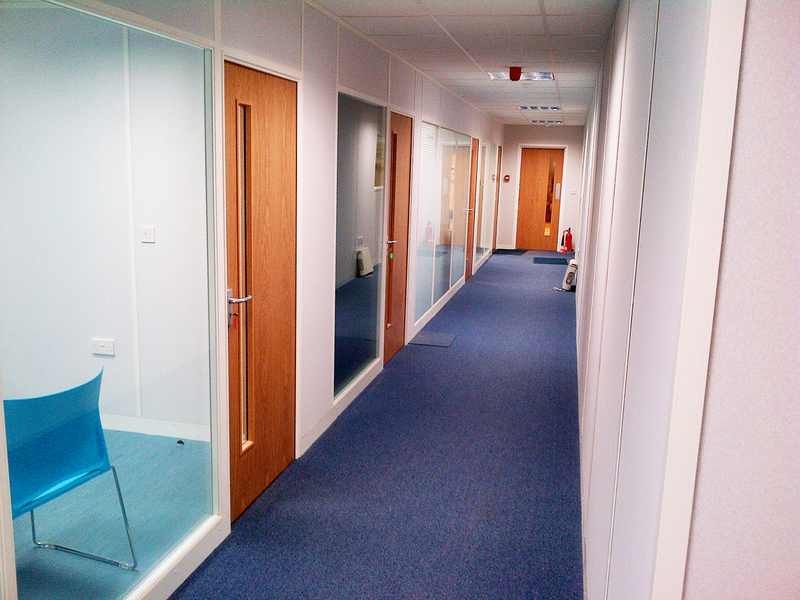 NSI was contracted to address this situation with the installation of half hour fire rated partitioning. The design was to include an operations room, rest area for pilots and lounge facilities, to turn the hangar in to a more friendly workplace. The needs for these interiors were unique, requiring excellent sound insulation to protect against aircraft noise, as well as fire protection in case of an aircraft fire. Fortunately, NSI are expert in fire rated partitions Merseyside, so could design a project that suited the needs of both staff and passengers. The 75mm thick partition walls were made using 50mm steel studding with a cladding of 12.5mm plasterboard. Windows were installed manufactured from 6.4mm toughened glass. Rockwool insulation was fitted in the wall cavities and above the ceilings to reduce sound from the aircraft. The suspended ceilings of 600mm x 600mm tile and grid also contained the air conditioning units and ducting (the above was held within the self-supporting ceiling grid). The introduction of the office and rest area has transformed the day-to-day comfort and morale of staff and created a professional appearance to incoming personnel. “All parties are very impressed with the finish and time it took to build”, commented consultant John Melvin. Contact NSI Projects for more info about commercial interiors North West.